CreativeCon helps students from all majors discover how to apply their creativity and other skills to a variety of careers. From childhood through the college, artistic, creative students dedicate time to honing their skills and perfecting their craft. These talents can continue to be utilized as Redbirds enter the workforce, in fact there are many ways to weave these interests into many career paths. On October 17, the Career Center, in collaboration with the College of Fine Arts, is hosting CreativeCon to help creative students discover related career paths, regardless of their major. Held at the Center for the Visual Arts, the program connects students with similarly-skilled alumni and employers. Through conversations, activities, and career-focused workshops, Redbirds explore, reflect, and learn how to act on their creativity in their careers. CreativeCon includes breakout sessions that provide students the opportunity to network, hear alumni stories of success, and gain information regarding transferable skills and freelancing/gigging. During the networking session, Redbirds gain tips and strategies on how to make connections in their industries of interest. Students will draft and practice a 30-second commercial to utilize when introducing themselves to professionals. The alumni stories session will feature advice on how to apply creative identities across a broad spectrum of careers. During the transferable skills portion of CreativeCon, Redbirds will learn about skills that employers are seeking from any candidate, regardless of major, include career management, intercultural fluency, critical thinking, oral and written communication, creativity, teamwork and collaboration, information technology application, leadership, and professionalism. They will also discover how to apply those skills to creative careers. CreativeCon also educates Redbirds on how to leverage creativity in arts related and non-arts related jobs following graduation. The freelancing and gigging breakout session will encourage students to identify freelance opportunities to include on their resumes. Redbirds will learn how to market their freelance experiences and self-starter skill sets. 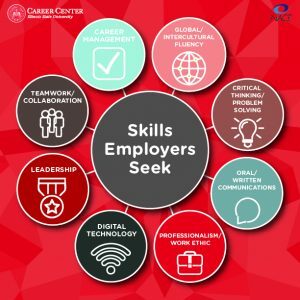 CreativeCon is another example of how the Career Center implements its mission to assists students with developing, evaluating and/or implementing career, education, and employment decisions. The program also supports Illinois State University’s Educate ● Connect ● Elevate strategic plan.